What Do I Do If I Am In An Auto Accident? What Safety Laws Apply to Trucks? What are Some Common Causes of Truck Accidents? When Should I Consider a Claim for a Maritime Injury? Radiology and diagnostic testing encompasses a wide variety of subjects and medical specialties. 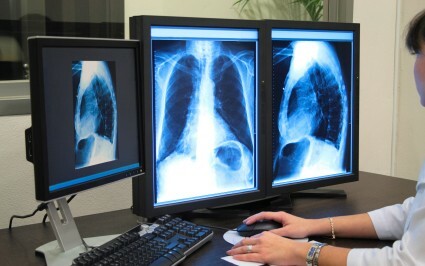 The field of Radiology includes any type of imaging or scan used to diagnose or treat disease. It includes x-rays, MRI’s, CT scans, Ultrasounds, Mammograms, and a host of other interventional radiology procedures and scans. Most medical/legal issues involving radiology involve the correct interpretation of a film study which has been performed on a patient. Misinterpretation of radiological scans can have dire consequences for the patient. It can lead to a delay in diagnosis, allowing the disease process to spread and become worse or lead to a failure to treat a deadly condition. In Mammography, for example, failing to properly diagnose a possible breast cancer can lead to a metastisis and even death of a patient. Interventional radiologist not only use film studies to diagnose patients, they also perform interventional therapies to the patient. Some examples interventional procedures performed by such radiologists might include biopsies, epidural injections, nerve blocks, cancer treatments, angiography and embolizations. Nuclear Medicine involves the use of small amounts of radioactive material to diagnose and treat diseases. This is common in treatments for certain cancers and some types of heart disease. In this procedure, a radiotracer is either injected into a vein or swallowed or inhaled. The energy given off by these tracers are detected and measured to produce pictures offering details about various structure or organs involved. As with any procedure, there are a variety of risks and complications that can arise. Distinguishing these generally accepted and unfortunate risks from medical negligence is often not an easy task. Moreover, hospital policies and procedures may also play a vital role in the exchange of information between a radiologist who interprets the films and the treating physician who is rendering treatment based on that information. The failure in communication between these physicians may also result in untoward consequences for the patient. The contents of this site are for informational purposes only and not to be taken as legal advice. If you are in need of any advice or have any questions, please contact us and we would be happy to help. If you need immediate medical attention please call 911 or your doctor.